Of all the picture books for children, this is one of the most exhilarating to read aloud. Just look at the cover. The main character, looking “pleased as Punch”, tiptoes across a trapeze line suspended slackly over the New York skyline while a group of cops stare impotently up at him from a rooftop below. He looks at us out of the corner of an eye, his smile gleeful, his pointy toe poised for the next step. He is on top of the world, ready for his next audacious act, secure that he will triumph over the forces of law and order. Let’s look at the plot. The Professore Tucci-Piccini, (pronounced, as he explains, “Too-chee Peach-eeny”), has just arrived at JFK, Punch and Judy cast in hand, when the suitcase holding his star puppet is snatched by a thief. Disgusted that their heist turns out to be a doll, the gang of robbers tosses Punch out the window. He survives the 40 story fall, taking out a window washer and a wedding cake on the way down. Upon landing, he is off and running in the streets of Manhattan, where he has a series of antic encounters with a seat stealer, a hot dog vender, a policeman, and a crocodile. Manipulating a trio of muggers into waylaying a chauffeur, Punch slides into the driver’s seat of the Rolls Royce of Mr. Helmstrump, the world’s richest man. He drives over a police car and a bus before getting snagged by a crane and flung over the rooftops until he lands with a bump in front of the Russian Tea Room, taking the awning down with him. “’No tea today, thank you, James,’ says Mr. Helmstrump.” With cushy job in hand, Punch finds the Professore and his cast performing in Central Park, and they join him for the fat life. Alice Provensen dishes up a witty take on the classic anti-hero. In the typical Punch and Judy show, as performed by Giovanni Piccini, a famous “professor” (as the puppeteers were known) some 200 years ago in London, Punch tosses his baby out the window and proceeds to kill off a whole cast of characters, beginning with his shrewish wife and ending with the devil. 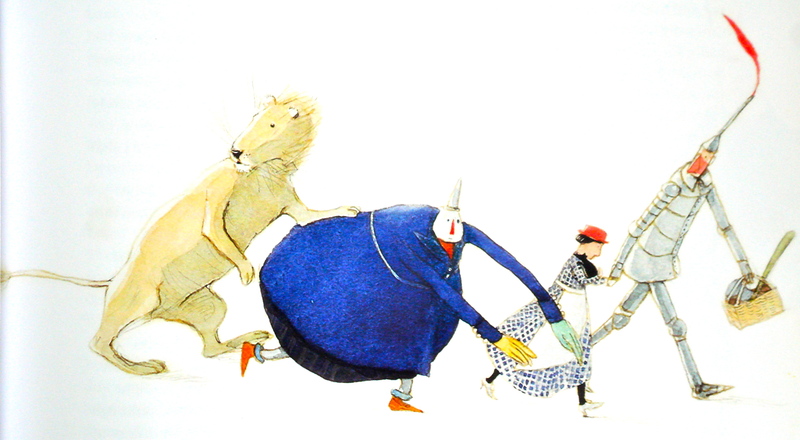 Provensen makes a few adjustments and gives us a trickster who is easy to like. She lets him wield his stick at Joey the Nasty Man, who surely deserves some punishment, but she has a manhole crocodile (another stock character in the Punch and Judy firmament) chomp the pursuing cop. She lets Punch spray paint graffiti on the Rolls, but we laugh because “Stupid” is an intrinsically funny word. And who would begrudge Punch for taking advantage of Mr. Helmstrump (any New Yorker would recognize the nod to the Trump and Helmsley empires in the illustrations)? Provensen, ever young with her crisp ironic sense of humor, wrote Punch in New York in her seventies. Over a 50+ year award winning career, she wrote and/or illustrated (either solo or with her husband, Martin, until his death) dozens of distinctive books. Try Our Animal Friends at Maple Hill Farm or A Day in the Life of Murphy for a taste. 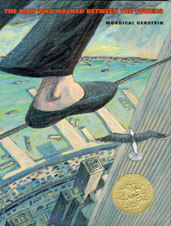 Aside: There is another book with a high wire act over New York on the cover, The Man Who Walked Between the Towers by Mordicai Gerstein. In 1974, the French trapeze artist, Philippe Petit, in an audacious act of guerilla performance art, strung a wire between the twin towers and proceeded to dance for an hour to the amazement of the onlookers on the sidewalks far below and the grudging respect of the cops waiting with their handcuffs. This book, with its beautiful cover illustration, tells the tale.